WASHINGTON (CNS) — The following books are suitable for Christmas giving. 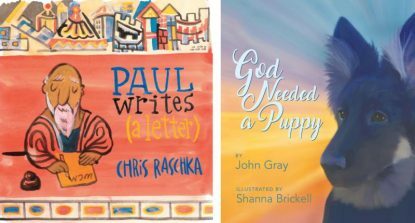 Eerdmans Books for Young Readers (Grand Rapids, Michigan, 2018). It’s no surprise author and illustrator Chris Raschka is a two-time Caldecott Medal winner. The watercolor map of St. Paul’s travels throughout the Roman empire immediately hooks readers and welcomes them into an ancient biblical world reinvigorated with contemporarily edited prose and gorgeous lettering. St. Paul is introduced to children as a friend, speaking tenderly in a common language. He calls to mind God’s love, God’s commandments and offers his own divinely inspired lessons. “You reap what you sow. If you begin something out of badness, badness will grow,” he said, adding, “Please don’t bother me if you don’t like this letter.” He gently reminds the “busybodies” out there to “please stop that and quietly get back to your own work” and introduces his friends Prisca, Luke and Aquila throughout his letters. Ages 6 and up. by Katie Warner, illustrated by Meg Whalen. Tan Books (Charlotte, North Carolina, 2018). Young children who like hearing simple call-and-response prose or who are learning to read by repetition will enjoy “I Went to Mass.” The sketch paper-and-pencil illustrations, mostly in shades of charcoal, pair well with the text. The book teaches the littlest Mass-goers to notice key elements of a church and the liturgy. Similar in its simplicity, “Cloud of Witnesses,” also by Katie Warner and Meg Whalen, is an introductory board book for children to learn about well-known saints such as Sts. Teresa of Avila, Augustine and Francis using simple quotes from the saints themselves. Both would be nice companions to keep little hands busy and minds focused during Mass. Ages 2-5.
edited by Jerry Windley-Daoust and Mark Daoust. “The Complete Illuminated Rosary” is a gorgeously illustrated rosary on pages. With 90 works of classic and contemporary art, this unique book helps children pray the rosary in a new way: with words and images for better concentration and increased meditation. As parents of young children know, meaningful prayer time can easily derail in boredom and distraction, but this book includes the full text of every prayer paired with compelling images. The prayers are printed in order, guiding children and their families to learn the rosary with the help of the intentionally selected sacred art for meditation. Each mystery is opened with a short, child-friendly, Scripture-based introduction. The mysteries can be purchased as separate books for $20 each. Ages 3 and up. Paraclete Press (Brewster, Massachusetts, 2018). Beginning with the queen of saints, this daily devotional is so efficient even the most impatient and distracted middle-schooler or teenager can handle its contents independently. Younger children, with the assistance of parents, also can enjoy the book, which introduces a different saint every day with a quote and message for reflection. “My Year with the Saints” could be the perfect on-the-go way to do family faith formation. Too busy to sit together to read during morning or evening prayers? Copy a daily message and slip it into your children’s school bags. Ages 8 and up. by John Gray, illustrated by Shanna Brickell. This children’s story is sweet and comforting for any child (or adult) who has lost a pet. Illustrated with breathtakingly real drawings of remarkable detail and illuminated with streams of light, readers will surely question whether or not the images are drawn or photographed. Unfortunately, what the book has in story and illustrations, it lacks in Catholic teaching. It would be helpful if the book included resources for families to find more information about Catholic teaching on animals and heaven. Popes throughout the years have wavered back and forth on the matter, but most recently Pope Francis in “Laudato Si,’ on Care for Our Common Home” echoed what St. John Paul II had said decades prior, that God created animals so they could join us in heaven. Ages 5 and up. by Pamela Love, illustrated by John Joseph. Gather your children around and watch their eyes open in awe as you share with them the story of the miracle of the Loretto staircase. Little is more enjoyable than watching the joyful surprise of little faces processing that this was indeed a true story and the staircase still stands today. “Staircase for the Sisters” tells the story of the mysterious carpenter who answered the prayers of desperate sisters needing a staircase to their choir loft. Some say the carpenter was an angel, others say it was St. Joseph himself. No one knows for certain. Although the illustrations are cartoony, the joyful illustrations pair well with the story. Ages 5-8.
by Benedicte Delelis and Eric Puybaret. Twelve animals from the Gospels tell the stories of Jesus as they see it. From a grateful fish witnessing a strong man calm the seas and assuage the fears of his fellow fishermen to a startled sparrow falling from a nest, each animal shares a unique and innocent insight into Jesus. The stories are vague, leaving little listeners eager to read the entire Bible story to give each story context. Luckily, each vignette is accompanied by a Bible verse for further reading and discussion. Ages 5 and up. by Gaelle Tertrais and Adeline Avril. A history book for children, “Who Is Jesus” allows readers to explore the everyday life of God’s only son. It cracks open some interesting facts children would find intriguing (what did Jesus eat?) and reinforces important information skewed over the years (the magi were not kings). The stories of the Gospel are given context, and the man whom Jesus became is given deeper meaning with this beautifully illustrated book. Even though it’s written with children in mind, parents will learn a ton from its pages. Ages 9 and up. by Sister Mary Lea Hill, FSP. Pauline Books and Media (Boston, 2018). Children, families and their teachers now have a book that comprehensively covers the history of the Catholic Church, from its birth at Pentecost to the retirement of Pope Benedict XVI and election of Pope Francis. Designed with young readers in mind, the text is appropriately interrupted with interesting graphics and sidebars to maintain attention. The “More than the Facts” feature introduces interesting science and math information and the “Mystery of History” block teases children to want to know more about some of the lesser-known but intriguing characters and events of the time. Of course, it’s chock full of stories about saints, popes and events that have shaped the church as it is today. Ages 10 and up. Lordan has master’s degrees in education and political science and is a former assistant international editor of Catholic News Service. A mother of three young children, she is a digital editor at Peanut Butter & Grace, an online resource for Catholic parents.